This pre-washed super soft midweight fabric won’t weigh you down. 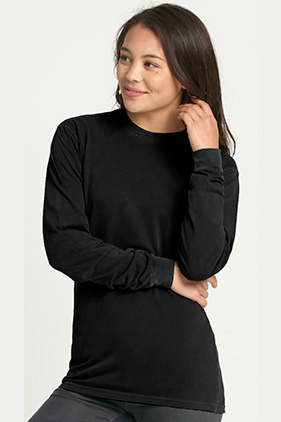 100% combed ring-spun cotton 24 singles 5.4 ounce midweight jersey long sleeve t-shirt. Soft and comfortable and a great option for a slightly heavier tee. 1x1 baby rib set-in collar with front cover stitch. Double needle top-stitch around armholes. Side seamed. Dyed-to-match twill tape at back neck. Tear Away label.